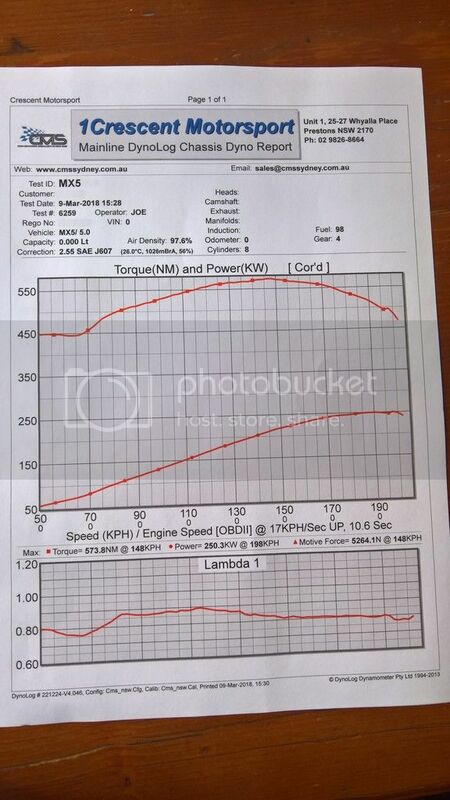 V8 Miata Dyno Results Show them who's boss. Ford 331 stroker, TFS 11R 190cc heads and TFS R Intake with 75mm TB and custom Ed Curtis Cam ([email protected] thou and 0.6 in lift..its a small and civil cam for daily street duties) running about 11:1 comp. Transmission is T5z, Diff is 3.27 LSD Ford 7.5 and Tire size is 215/45 R17. The car was wheel spinning on the dyno and throwing off some rubber chunks as it hit the redline LOL...We did not have the car strapped down, so it probably makes a little more if strapped. We kept the A/F ratio at 12:1 as the comp was a bit higher than expected so we played it safe, probably 5-10 rwkw in leaning it out a little more to 12.7:1. But in the end 5-10 rwkw is neither here nor there on the road..plus those kw's are only available at 5800-6200rpm anyway. I could have easily made an additional 20-40 rwkw with a stronger cam, but it makes the car more tiring to drive daily in traffic. i didn't want a very lumpy car that spits fuel at idle due to valve overlap as I need to make sure it passes emissions and noise. Most important thing to note is area under the curve for both torque and power. The torque curve on this engine is very flat and long, the effective operating range of the cam is 1800-5800 rpm (what you need on a street car). The graph shows the road speed as opposed to RPM. The test was done in 4th gear a 1:1 ration on a T5z. Converting to RPM the 70 kph start point is 1950rpm and the end point of 200 kmph is 5700 rpm (was getting some spin at the top end on the rollers). 1992 Ford Powered Dyno Results from Sat.